The National Highway Traffic Safety Administration (NHTSA) reports that nearly 30 percent of all automobile accidents in the United States is the rear end collision. That’s nearly one third of all accidents! 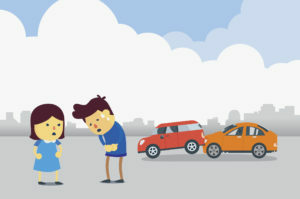 There are many ways you can take action now to prevent a rear end collision from happening. We’ve put together a list of some of our favorites. This is the number one way to avoid rear end collisions! The more space you leave, the more time you have to react to sudden braking and the more room you have to stop your vehicle before it hits the one in front of you. You should already be checking your mirrors every 6 seconds or so, as well as every time you stop or brake. Pay attention when you stop; is the vehicle behind you stopping as well? If not, you may be able to give them extra time and space to do so. Focus on driving, don’t be distracted. Distracted driving is another top cause of collisions of all kinds. Keep your eyes on the road and you’re more likely to notice the brakes in front of you, the car cutting you off, or the driver who doesn’t see you. When you’re coming up to a stop sign, a red light, or another obstacle, begin braking early (without riding the brakes) and stop slowly so the person behind you can see that you’re slowing down and has time to react. Make sure your brake lights work. Brake lights are a safety feature and it’s important that they’re working properly. Without them, the car behind you cannot tell (easily) that you’re braking, and you are more likely to get rear ended. Pay attention to the driving conditions. Yes, you need to brake when the car in front of you brakes. But if the roads are icy, it’s deer season, children are playing nearby, there are bicyclists on the road, construction is happening… it’s important to leave extra room, adjust your driving habits, and be ready for sudden braking. No, you cannot see everything that the driver in front of you can see. But, you can leave enough space between you and the large vehicle in front of you to see around it, or, you can pass so that your view is clearer.